Birdshotters and their partners are definitely trying to get more active in 2018. In the process they are also hoping to raise valuable funds to help pay for some much-needed birdshot research. 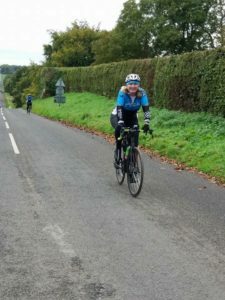 We are particularly impressed that Louisa, a recently diagnosed birdshotter from the York area, has decided to take on a massive cycling challenge: two thousand and eighteen miles in the year 2018. She is doing this to help celebrate reaching her 50th milestone birthday. Road cycling is a sport she has only recently taken up, proving that it is never too late to start. Diagnosed last year, Louisa has also taken to cycling the 30-odd miles from her home to her eye appointments at York Hospital. Louisa’s fundraising has already got off to a really good start, but she would be delighted if you should like to help her towards achieving her target. 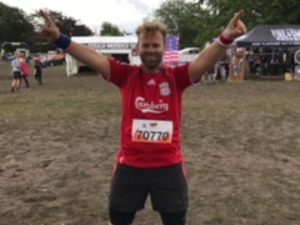 Roger Brown is running the London Marathon in April 2018, helping to raise awareness about birdshot uveitis. He is also raising much needed funds for research into birdshot. He fully appreciates the impact that this rare eye condition can have on an individual, as his wife Caroline has been living with birdshot for the last six years. He knows just how tough it has been for her, and for the team treating her, to find effective treatment. Research is desperately needed to find better options to treat birdshot. Birdshot Uveitis Society is delighted that Roger is running in the London Marathon this year. Places in the London Marathon are like gold dust. To get a place, you have to promise to do substantial fundraising. For a small charity like the Birdshot Uveitis Society, its tough getting marathon places, so we are delighted to be teaming up with Fight for Sight to do this. You can click on this link to read Roger’s story in detail. He’d love it it if you chose to support his marathon run as he needs to raise £2500 to keep to his side of the deal with Fight for Sight. Team Birdshot is also taking part in the Moorfields Eye to Eye 14 mile walk on the 4th March 2018. If you want to take part in this walking challenge, further details can be found here, and there is also a JustGiving link where you can donate. This entry was posted in Fundraising, General, News and tagged fundraising events by Annie. Bookmark the permalink.